Ah zucchini! Who doesn’t love zucchini? I know what you’re thinking, there’s lots of you out there who don’t love zucchini, but why not? Have you ever had stuffed zucchini? 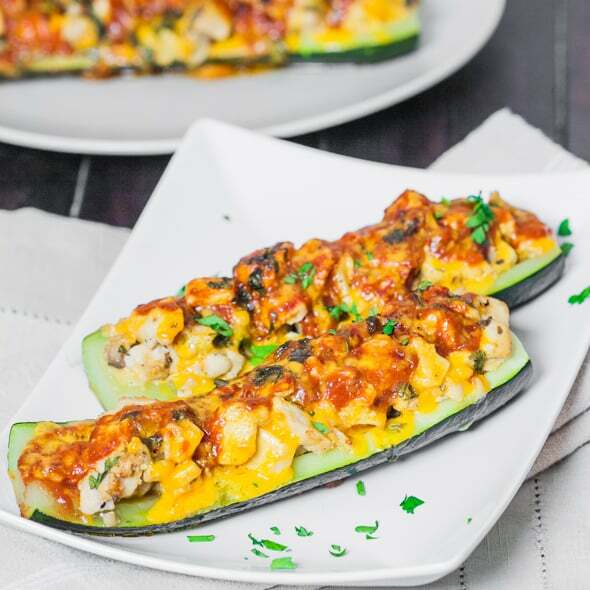 They are perfect for stuffing, but there are many other ways to serve zucchini. When I was a kid, my mom used to slice up the zucchini into thin, about 1/2 inch, slices. She would then put them through egg wash, then some flour and fry them. Do you know how good they are? One of these days I’m going to try to bake them like that, but instead of flour I’d use Panko breadcrumbs. But today I did not fry my zucchini, today I stuffed my zucchini. I stuffed them with chicken, enchilada sauce and cheese. YUM! They are good my friends, they are delicious. They are so good, even you zucchini haters might like them. 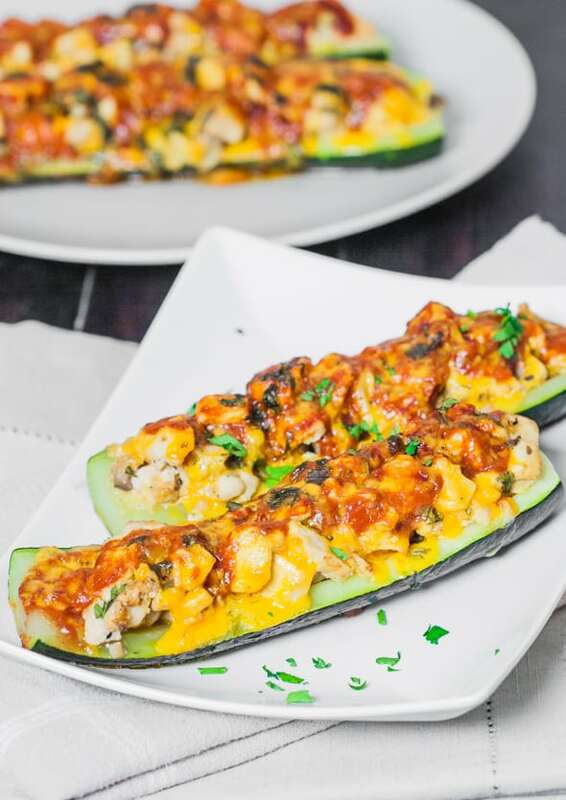 It’s like an enchilada but in a zucchini. So you’re cutting calories, and you’re eating good healthy food, not to mention this would be a perfect meal for those of you out there cutting carbs. Cut the zucchini in half, lengthwise. Using a small spoon or a melon baller scoop out the flesh. Chop up the zucchini flesh and mushrooms. In a skillet add the tbsp of olive oil and heat. If you're using cooked shredded chicken, add zucchini flesh, mushrooms and chicken to the skillet together, otherwise add the chicken first and cook until no longer pink. To it add the chopped up zucchini flesh and mushrooms. Season with salt and pepper, cumin and oregano. Spoon the chicken mixture into each zucchini boat, stuff them well, there shouldn't be any mixture left. Spoon some of the enchilada sauce over each zucchini, dividing the sauce equally. 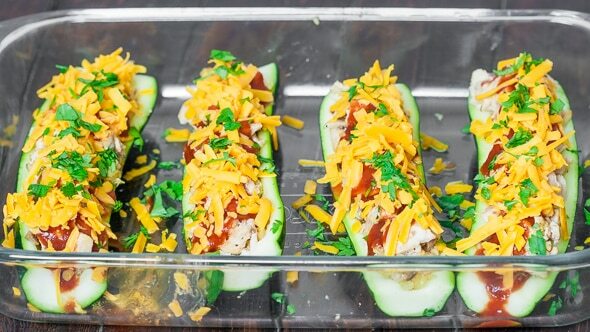 Sprinkle each zucchini with cheese. Place zucchini on a baking sheet and cover with aluminum foil. Bake covered for about 30 to 40 minutes or until zucchini is cooked through. Garnish with green onions or parsley. This looks amazing… I HAVE to try this!